The Power to the Peaceful concert in 2010 was an epic draw. So popular, in fact, that the city’s annual Michael Franti vehicle could never again be free — and, for now and for the foreseeable future, the show will no longer be. A massive, bigger-than-ever turnout of 80,000 people at the show’s eighth edition caused massive, bigger-than-ever headaches for neighbors and city officials, who complained of traffic gridlock, a clean-up crew that showed up an hour late to clean a trashed meadow, and music that didn’t stop when it was supposed to (Franti played past the 5 p.m. cut-off time, forcing Park Patrol to literally pull the plug on the show at 5:05 p.m., according to a city staff report). 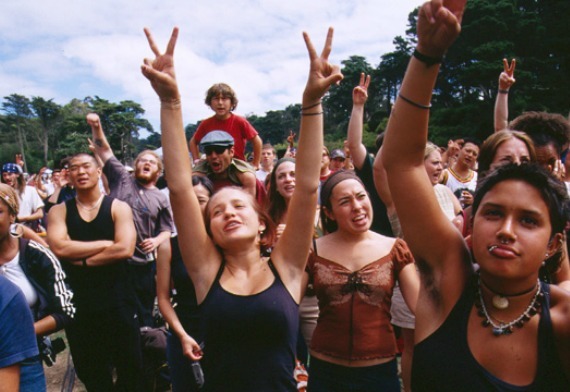 So organizers put the Golden Gate Park yoga-free music extravaganza on hold in 2011 while a new plan — including charging $10 for tickets, limiting attendance to 40,000 and hiring additional cops and security — was hatched after “numerous meetings and discussions” with Rec and Park. True, city officials planned to charge organizers $94,000 to use the park, including a $10,000 security deposit. And that figure doesn’t include the mandatory hiring of additional plainclothes security as well as off-duty San Francisco police officers, hired at time-and-a-half. Yet the Power to the Peaceful Web site has no mention of the approved-and-abandoned plan to charge concertgoers $10 per ticket. unavailability of tickets at the door will be advertised and promoted continuously,” said a Rec and Park staff report amusingly dated April 20, 2012. PTTP’s cancellation caught concertgoers as well as the city off guard. “The concert was approved and … we were moving forward until the event host for the Power to the Peaceful decided to cancel,” Rec and Park spokeswoman Connie Chan wrote in an email. Representatives for event promoter Guerrilla Marketing did not respond to emails or a telephone message this week. Nor did Franti or his people say hey to the San Francisco Examiner when the newspaper came calling this week. It’s unclear how Rec and Park arrived at the $94,000 figure. Hardly Strictly Bluegrass, by comparison, paid $130,000 in fees to use more of the park for longer hours and on more days, according to Chan, who sounded apologetic about the decision to charge for what once was a free show. “While we support community events that are free and open to the public, we also have to balance the demands to ensure public safety and minimize neighborhood impact,” said Chan, who added that Outside Lands, by contrast, paid $1.45 million for its 2011 shows. Is this fair? We don’t yet know: Cost estimates for other free concerts in the park, like Top 40 radio station Alice’s “Summerthing,” were not available. We recall placidly bouncing a beach ball with tens of thousands of our newest friends without incident at past Powers to the Peacefuls, but apparently organization was not the promoters’ strong suit. In addition to being ill-suited and ill-prepared for the crushing crowd, an issue with vendor control led vendor vehicles to wander aimlessly about the park in 2010, according to the staff report, and Park Patrol officials wrote of a Sunday morning cleanup crew that showed up an hour past the prescribed start-time, according to the report. Park Patrol also had issues with alcohol at the 2010 shindig: the staff report complains of underage drinking and too many concertgoers hauling coolers to the meadow for the afternoon. The new, canceled Power to the Peaceful was to feature drink tokens, trained beer vendors who would untap kegs no later than 4 p.m., and a strict no outside alcohol policy, the report said. In other words, a much different scene. Franti is still a fine draw: the musician played an epic set at this year’s Gaia Festival last weekend in Mendocino County. He’ll also be performing at the SF Giants first annual yoga day September 5, and is a one of the owners of in Soulshine, a “villa, retreat oasis and cafe” in Ubud, Bali.